Massive wooden door, old bricks and rustic beams of Harrisonburg’s old City Produce Exchange building, the perfect setting for a memorable dining experience at The LOCAL Chop & Grill House. Bring your friends and savor the atmosphere, food and drink that set us apart from other restaurants. Our menu features fresh, hand-selected, LOCAL and seasonal foods prepared with a progressive flair by Chef Colin Auckerman. 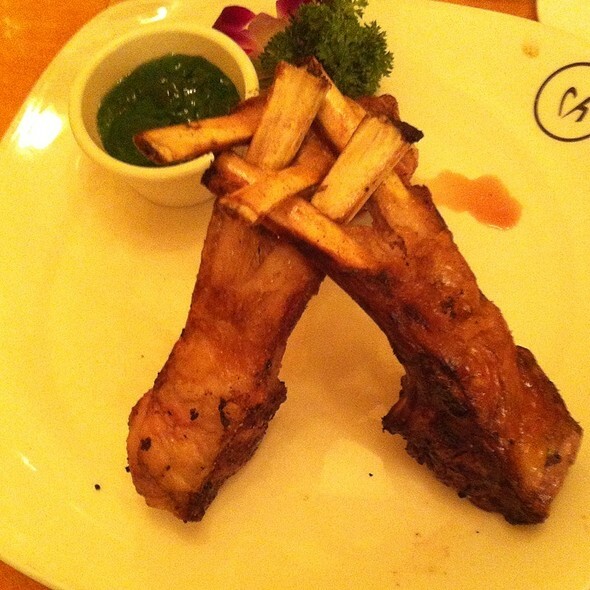 Farm to Table is the mainstay of our eating philosophy. That’s why we work with community food producers to support organic, sustainable, LOCAL farms, and put the finest, freshest foods on the table for you. We’re serious about making choices that are environmentally sound, from the food we carefully hand-select to the aprons our kitchen and wait staff wear. 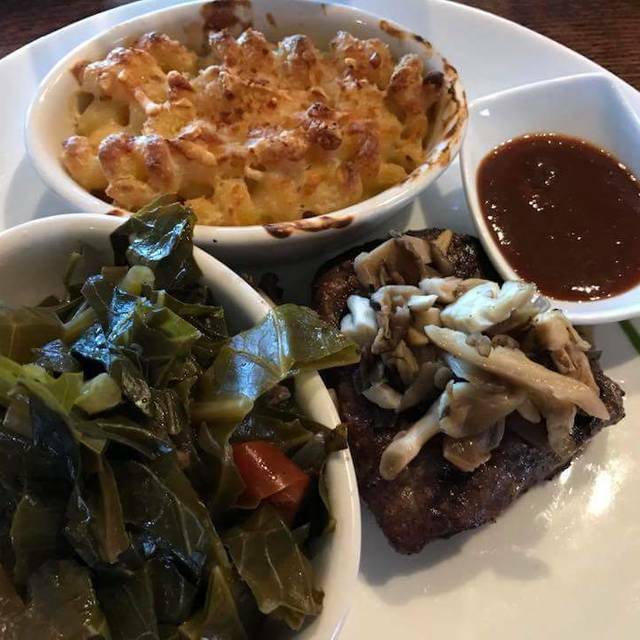 Casual and fun, The LOCAL Chop & Grill House brings you world-class dining with a decidedly LOCAL flavor. We actually had a booking for 6 a week after the date we showed up and the restaurant could not have been more gracious. A fabulous meal .... my daughter celebrated her 19th with us and the wait staff was just perfect. Innovative, elegant and delicious! We opted for some very exquisite Bordeaux's and our party of five each selected something different as entree's and everyone was very satisfied. 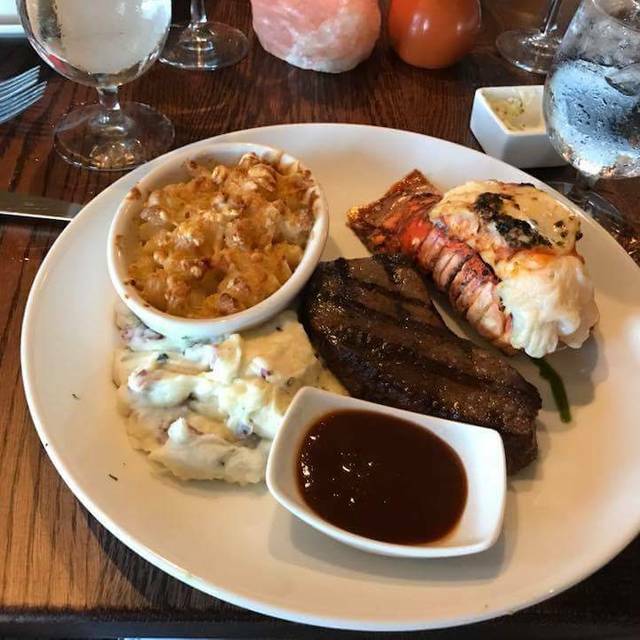 We chose two types of steak, scallops, salmon and a seafood stew. The first course salads were well executed, and the seasonal salad with preserved lemon dressing, local mushrooms and a variety of other amazing ingredients will be remembered for a very long time. Each entree has a speciality sauce chosen by the chef, but you have the option to ask for a different sauce on the menu if you prefer. All entree's were perfect temperature and desired wellness. We capped things off with a few desserts which were delicious. Chris took exceptional care of our group, and we were wowed from focaccia to creme brûlée. Harrisonburg is incredibly lucky to have this wonderful restaurant. The food was excellent. Service was superb. Wonderful dinner, food was amazing. It is very expensive for Harrisonburg but, great for a special occasion splurge. Our waiter, Christopher, was awesome, very professional, helpful and informed. Try the scallops, they will be the best you've ever had!! Thanks!! This was our second time coming here to celebrate our anniversary! We ordered the crab cakes for our appetizer and it was delicious! As our entree, we decided to get the special, which was the 40oz porterhouse steak that was meant to share. As a side, we got the Mac and cheese and the mashed potatoes and they were delicious as well. 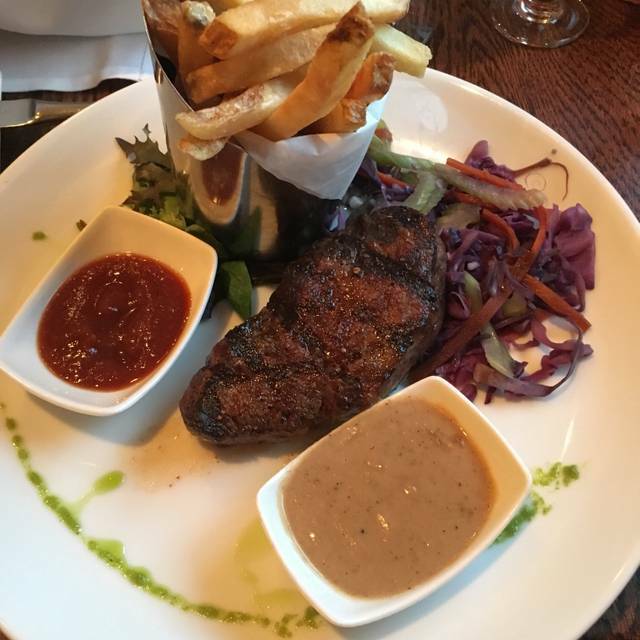 The steak itself was good, but I did feel like some parts were cold. Overall, we’d come back again to celebrate our anniversary! This was a delicious meal with stellar service and an accommodating staff. A definite winner! The service along with the food and drink were all excellent. If we are in the area again we'll definitely return to Local. Traveling through on our way south. Lovely dinner of filet and strip. Hope our travels bring us through Harrisonburg again so we can return to Local Chop & Grill House. The Service was very professional, and the food was served properly, timely, for all of us to enjoy together. Everyone at the table enjoyed their choice. My steak was perfect. Great meal! Great atmosphere. We had a great experience. We were disappointed in the appetizers. We ordered the pork belly. For $10 we expected a bigger portion. The flavors were really good. The food was very good. Our waitress was very knowledgeable and helpful. The bar tender was not very friendly. Special restaurant for soecial occasions. Everything is excellent. This is Harrisonburg's best restaurant without a doubt. Was only our second time to visit and we were not disappointed. Food was great as the first time.waitress was friendly and easy to talk to.The meal came out hot and ready to dig into. Will definitively be going again. Once we got our dinner the steak and salmon were great. The calamari was cold but we were afraid to send anything back since we were starving. It took an hour and a half for dinner to be served. There was a large loud party of 40+ upstairs which apparently delayed our meal. After an hour someone appeared and apologized but no offer of an appetizer to hold us over(or even more bread) though the water guy kept coming around. Disappointing experience, though the food was good. We ate at the Local Chop & Grill as a treat for my 79th birthday. Our waiter was outstanding with his constant helpful service. He was training a young man which was interesting. My husband and I both have to eat gluten free. He has celiac disease so couldn't risk any mistakes. The waiter knew all about it, and was able to guide us with the menu and knew smart adjustments to make. It was a beautiful evening, and I will share that with friends. Nice restaurant. Food was good but not exceptional. Was a bit disappointed with the meal. Will return, it is a nice place for a special dinner. Always great food! Need to add a NY Strip to the menu!!! Enjoyable. Good food and service. Nice ambiance. Great ambiance to celebrate a 75th birthday. We all had the 7oz filet. Absolutely wonderful. Food took awhile to come out - everything else was great. This is the second time I have waited over 1.5 hours for our food. 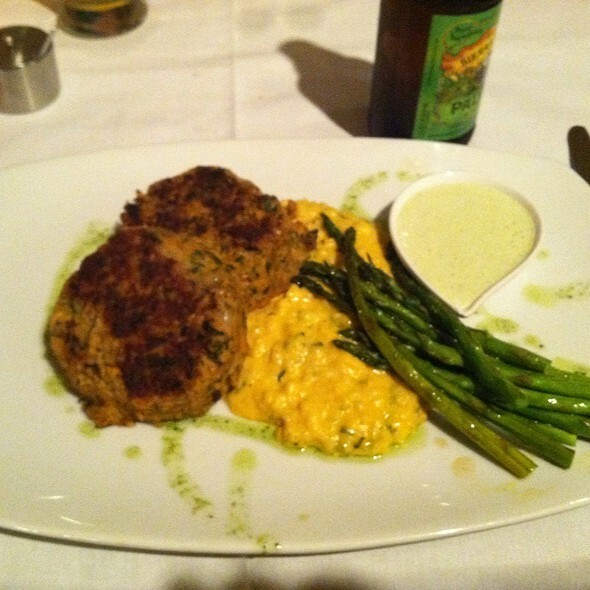 We visit the Chop House several times a year, and consider it our favorite place in town. Unfortunately, this particular visit was not up to its usual standard. In the Open Table reservation I noted we were celebrating our son’s 21st birthday. For any other celebration meal, we have received a specially decorated dessert plate, complete with candle. On this visit, no mention or special plate, which was disappointing. In addition, the waitress seemed overwhelmed and service was not up to par. Food was good, but portions smaller than normal, and the soup my husband ordered was not warm. 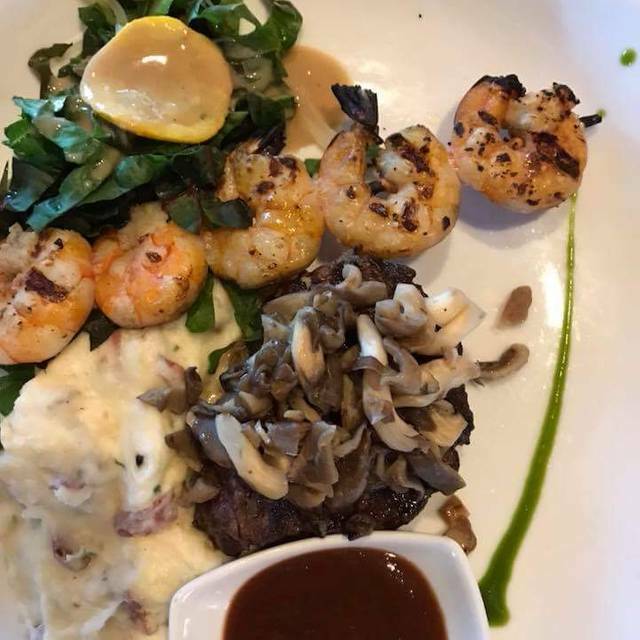 We hope this was just an “off” night, and will give the Chop House another try. The pork belly app and salad was very good as was the bread and butter. The steaks were cooked as requested but the duck fat fries didn’t really taste like they were fried in duck fat. The first order of fries were not hot and were limp. The replacement fries were hot and limp. To me the peach ketchup needed something like some curry or spice to balance the sweetness. Overall the food was good but the fries did not deliver. Great dining experience and we will return again for dinner. 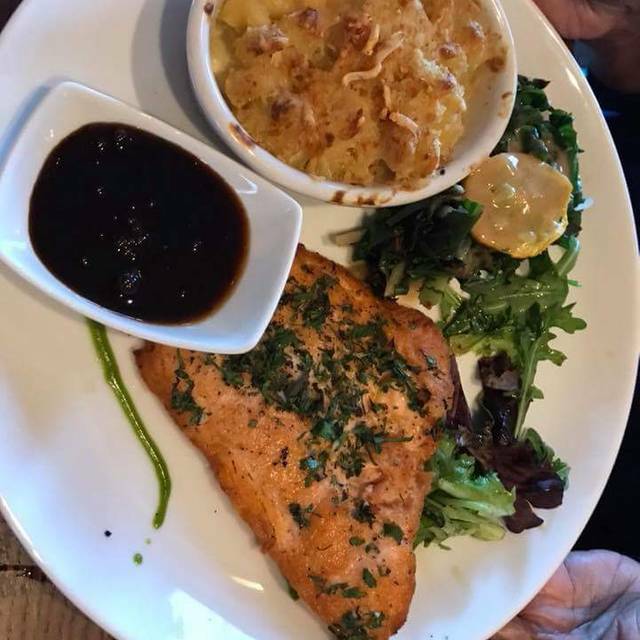 This was my first time going to the Chop House so I didn’t know what to expect. Absolutely loved the place, food and employees. They made sure we were taken care of and enjoyed our food. The chefs were amazing the food was perfectly cooked and presented. I can’t wait to go back! Our waiter was informative, attentive, and had a nice personality. The cocktails were fabulous and the food was delicious. Overrated - a "chop house" is a steak house. The biggest steak on the menu was 12 oz. I think. Weak. Not what I am looking for in a "chop house". Very nice, able to handle special requests. Always a great meal. We are here monthly when we visit our son at JMU. The food is incredible. The entrees are now paired by the chef with a sauce, which I am usualy not a fan of, but it was spot on. It is a little expensive, but definitely worth it if you are willing to splurge a bit for a nice meal. We loved our waiter. Unfortunately I don’t remember his name, but he waited on us outside. He encouraged us to take our time and he made the meal more enjoyable. Food was good, however the collard greens were extremely salty. Rather than offering a replacement side dish, we were offered vinegar to cut the saltiness. Otherwise we had a pleasant experience celebrating a belated Valentine's Day. We always love eating here. The food is top notch and the service is as well. But this time the service was not up to par. Our waiter never went into depth about the specials that we heard the waitress tell the nearby tables about. Everything was ok up until we got our main course. After we finished eating and were ready for the desert menu, nobody came around to wait on us. It was probably 30 minutes after we were done eating when I flagged down one of the staff and asked for our waiter. When he came once again he didn’t tell us what flavor of ice cream they had or even offer coffee. He just laid the menu on the table and walked off. One of the biggest reasons that we eat here is because of the whole experience, not just the good food. I don’t mind paying for a nice meal if the experience is as good as the food like it usually is. We were in the restaurant for 2 hours which is about twice as long as it usually takes. Hopefully this was just a one time thing and the next time is better. Our experience was, indeed, a mixed one. The ambiance and food was great. However, we had a 5:30 reservation for which we arrived right on time. Our entrees were not served until 6:55! No explanation was given by our server for the delay. Fortunately, we did not have further plans for the evening or what was a less than pleasant experience might have been even more challenging. Or second time eating here for a special occasion, it did not fail to impress. The service was good, the food fantastic, and the ambiance appropriate for the setting and price. We were on the glasses in patio area for the first time and it was nice and quite. Just what we were looking for to have good conversation. Chris, our waiter was very attentive and knowledgeable about options and wine selection. This is our go-to spot for special occasions and feeding out-of-town guests. Never disappointed. This was our second visit and it was as good as the first. The service was great and the menu had many choices. 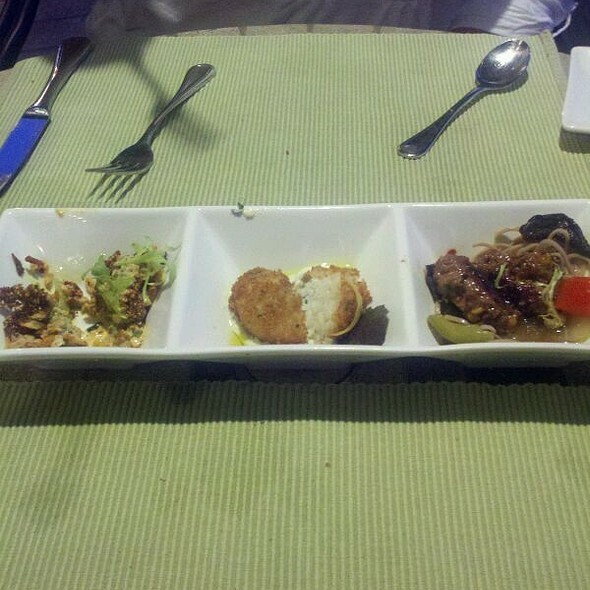 Our appetizers were shrimp and grits, and the Autumn Pork. The latter was not as good as the pork we had in September, a minor disappointment to my husband. 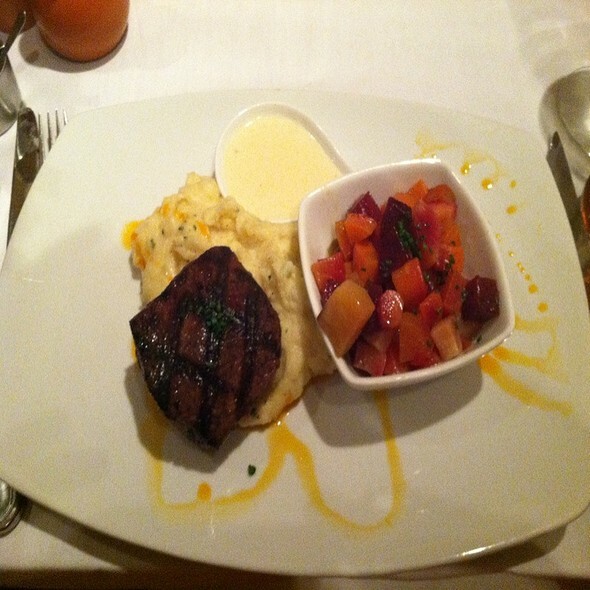 Our entrees of the duck and filet mignon were fabulous and the side dishes were equally well done. We will return to this restaurant again. Everything was amazing and we will be back when we are back in town.